So, back around the Gathering, I made short mention of a game that popped up in my Cacao box when I arrived home. A curiously small, self-produced game that had my name on it. It actually said that it was being donated to me. Nothing else about it – no designer, no source, no nothing. I didn’t know what to make of it, and then like many things, it got put in a big stack of games to be played later. A few weeks later, it finally made it to the table… it got a decent reception from the three who played it, and we brought it out again the next week. I still wasn’t quite sure what to do with it though – it was good but not awesome… I had a pretty clever card game, but I didn’t know how I got it, who made it, or what its purpose was. 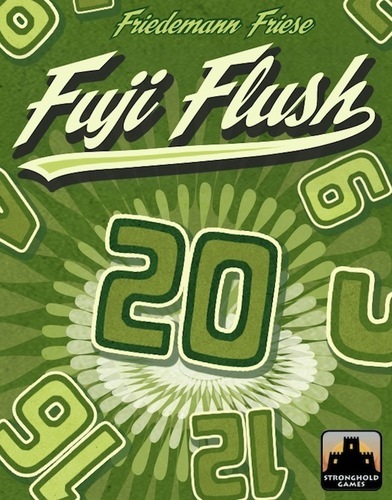 I was actually in the process of starting to write a mini-review on it, when I found this geeklist on BGG. As I read on, I found out that the game given to me was not exactly like the full version, and at that point, I held off on the review as it seemed to make more sense to wait and see what the production version would bring. I also chatted a bit with the people from 2F and ended up playing the game again. The concept of the game is simple enough. Be the first person to rid themselves of their hand of cards. The entire game is played with a 90 card deck, ranks ranging from 2 to 20. In general, the lower the rank, the more copies of that rank are in the deck. 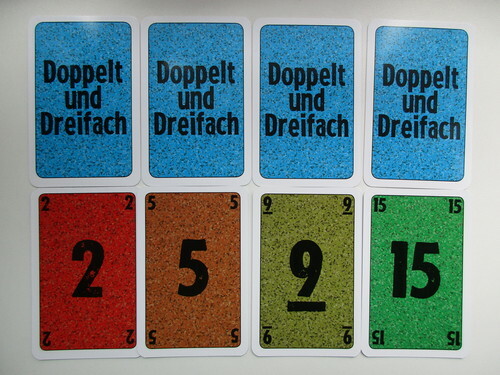 The deck is shuffled, and each player is dealt a hand of 6 cards. On your turn, you can play any card from your hand to the table in front of you. Then you check to see if any of the other players in the game have a lower numbered card in front of them. If so, your card defeats those cards. The lowered numbered cards must be discarded AND all of those players who discarded a card must draw a new card from the deck. As an interesting twist, if you play a card which matches the rank of one or more of your opponents, your identical cards join forces to be stronger! If I played a 7 card, and Karen had already played a different 7 card – our pair would now be worth 14, a value shared by both cards in the pair. Thus, all cards on the table currently under 14 must be discarded and a new card drawn from the deck. (Additionally, on a later turn, either of these 7 cards would only be discarded if someone played a 15 or higher…) If later on, a third 7 would be played, the total value would be 21 – and this total would be high enough to eclipse even the largest card in the game, the 20. 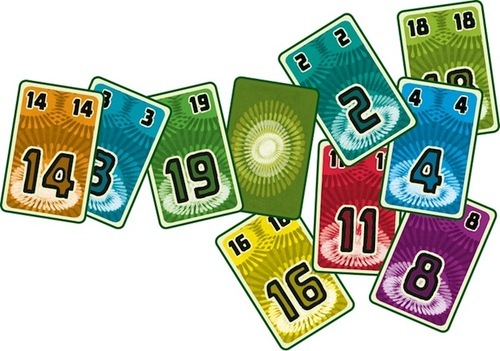 However, note that another player could not play a 14 card to match up with the two 7s already in play; the joining bit only works for identically ranked cards. Play goes clockwise around the table, with each player playing a card, possibly teaming up with other cards on the table, and then checking to see if this new play causes any other cards to be discarded. If play gets back to you and you still have a card in front of you – then you’ve survived the round and have “pushed your card through”. You are allowed to discard your card and you DO NOT have to draw a replacement. If you card was linked to other identical ranked cards, when one of them is pushed through – all of them are pushed through, and none of the players in this temporary alliance have to draw a replacement. The game continues until someone has pushed his final card through – that is, pushing a card though with no cards remaining in his hand – and at that point, that player wins. It is possible to have shared victories in this game because teamed cards will be discarded at the same time. That’s really all there is to the game! It’s remarkably simple, but the aspect of teaming up with your opponents gives rise to plenty of clever card plays. The starter pack game that I was given only went from 2-15, and I think there will be a bit more tactics with the addition of the higher numbered cards. To some degree, you’ll do better at this game if you’re able to draw the 18, 19, and 20 near the end, but that’s actually not a guarantee of success. The magic of the game is getting involved in these alliances where you can make your small cards into something useful. It’s a great feeling playing a 3 or 4 card and seeing it get pushed through as other people follow your lead. It’s also a nice play to watch someone’s super high card go down to a pair of 8s. I also received the game when I was at the Gathering. Just stepped away from a game I was playing to get some water and when I returned, there it was, with my name on it. No one I talked to knew where it came from, which was very mysterious and just a bit spooky. When I got home, I read the rules and as they didn’t particularly impress me, I put it aside. Then, more than 2 months later, I saw the Geeklist that Friedemann posted about it. A pretty remarkable experiment, but just the sort of thing you’d expect from him! Now that I had the back story, I wanted to try the game out. But I couldn’t find it! My best guess is that it accidentally got thrown away with all the other free goodies I got at the Gathering, many of which I don’t use. That kind of bummed me out, but I’m sure I’ll have a chance to try out the published game. Sorry about that, Friedemann, but I guess that’s what can happen when you try something truly different like this. At least it’ll give you another data point for your experiment!